Clark presenting the award to Srivastav. 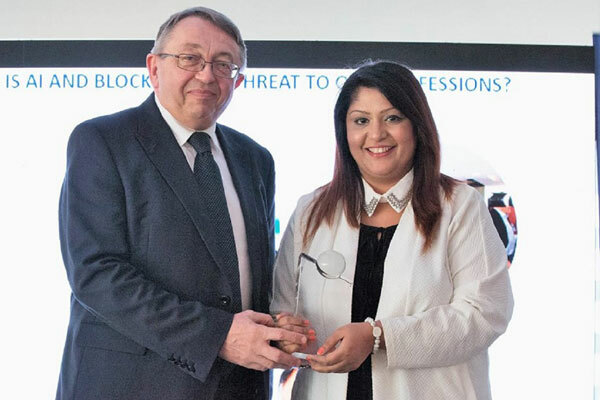 Dubai-based Shreem International Consultancy said its CEO Pooja Srivastav has been awarded the prestigious “Adam Global Outstanding Leadership Award” for her efforts to create toxin-free, sustainable body, buildings and structures in the UAE and across the world. Adam Global is a multidisciplinary professional network of lawyers, accountants and business advisors in the world. Its member offices are independent firms spread over five continents with the headquarters in London. The award was presented by Paul Clark, the former UK Transport Minister, at a ceremony which took place during the Adam Global International Business Conference in Dubai which was attended by Lords, ministers of state, ambassadors and business icons from the UK and Europe. More than 200 business leaders from five continents representing over 100,000 corporate clients, investors and business owners took part. Srivastav, Dubai’s first building biologist, is a pioneer in bringing energy solutions to the UAE and is a known electromagnetic radiation expert, said a statement from the company. She also possesses a deep understanding of Geopathic Stress – a distortion of the earth’s natural electromagnetic field that weakens human immune system, thereby making us more vulnerable to illnesses. Commenting on the win, Srivastav said: "I’d like to thank Adam Global for acknowledging our efforts. This will serve as an encouragement as we aim to create further awareness about ‘green buildings’ which are eco-sustainable and emit positive energy, inside and outside." "World over, builders and developers have begun using building material that reduces electromagnetic radiation and geopathic stress, a pollution that many people are not aware of, but which has consistent and gradual impact on our physical and mental well-being," he noted. Srivastav has been consistently working with different organisations, creating awareness for mothers, children and young students and participating in events such as Walk for Dubai, energy sessions for students at Westford University, holistic sessions for ladies’ groups in the UAE and self-care sessions for corporates such as Danube Welfare Center – all in line with meeting Vision 2021 goals of the UAE. She further conducted awareness programmes on Electromagnetic Rectification and Geopathic Stress Rectification at Saudi-German Hospital (Dubai), Aster Hospital (Dubai), Prime Hospital (Dubai), Dubai Silicon Authority, Hamariya Free Zone and Skyline College University (Sharjah). “Our vision is the same as that of the UAE government, and we’re working towards reaching the sustainable goals set by the government. We also aim to create further awareness in the UAE so that all of us can work towards an environment free of toxins,” added Pooja. Commending her initiative to promote geopathic stress rectified buildings, Taher Akhter, the founder and chairman of Adam Global, said: "We are proud to recognise Srivastav at the Annual General Meeting in Dubai with the Outstanding Leadership Award."